As students brace themselves to say goodbye to their summer freedom and head back to school, their parents brace themselves to say goodbye to their paycheck. The back-to-school shopping season is the second-largest seasonal shopping period of the year in terms of consumer spending. The shopping season was expected to produce about 68 billion U.S. dollars in spending in 2016. Retailers can thank the growing boys and girls for these sales figures. 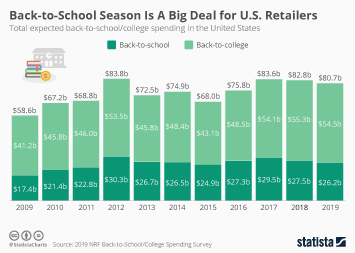 In 2016, the planned back-to-school expenditure among U.S. consumers amounted to about 673.57 U.S. dollars on average. Studies show that U.S. parents planned the highest expenditures for technology, clothing and accessories in both 2016 and 2015. About 17 percent of shoppers said that classroom lists and school requirements influenced 26 to 50 percent of their back-to-school purchases in 2016. U.S. consumers planned to use various methods of payments when purchasing back-to-school items: around 49 percent of U.S. consumers planned to use debit or check card payment in 2016. A 2015 survey found out, that mobile payment or digital wallet services are still in their infancy: some 93 percent of U.S. consumers indicated not to use those services. When it comes to snacks consumed during the school day, many U.S. school kids indicated to prefer salty snacks. In 2015, the dollar sales of salty snacks during the back-to-school season in the U.S. amounted to 6.7 billion U.S. dollars. Back-to-school expenditure in the U.S.
school supplies: paper, pencils, books, etc.